Mitchell Henson is pastor of the Glendale Seventhday Adventist Church in Glendale, California. Psychiatrists, psychologists, and various other mental-health professionals have become part of today's healthcare deliverers. Many of them show a keen interest in the therapeutic value of religion and approach their task with a genuine appreciation for spiritual values. With such excellent resource persons accessible, church members and pastors may wonder, "Should pastors counsel?" The answer is Yes now more than ever. Most problems in life have at their core a spiritual essence. Marital issues, midlife crises, and addictions all have a critical spiritual element. No treatment can ignore this and still bring healing. Insight alone is not enough. There must be energy for change. That energy can come quite naturally in the spiritual context of pastoral counseling. Pastors have an advantage in the counseling process. For example, secular counseling calls for professional objectivity. Such objectivity is all but a myth. It is virtually impossible for one person to listen sensitively to another and remain objective. Pastoral counselors are not shackled by this myth. They are expected to have opinions, provide guidance, and challenge demoralizing situations. Or consider the question of dual relations. Mental-health professionals are warned against having such relationships, which means they should not mingle with their clients in social settings outside the counseling arena. But pastors can, do, and indeed, in some cases, must relate in more than one setting. They preach sermons and officiate at meetings where their clients may be. A pastor may counsel with a couple about their marriage and later relate to them at a social function or serve with them on a committee. Such contacts can be advantageous in working with parishioners. If they can hear the pastor preach, teach, and then counsel, they get a sense of the consistency of the psychological, theological, and philosophical positions, which adds a high degree of authenticity to all three. Pastors serve on the front lines of mental and emotional health care. A recent study in the United States indicates that 42 percent of those who seek professional help were referred by a pastor. This compares to only 26 percent of referrals by family physicians. All pastors counsel whether they have specific training or not. When parishioners are troubled, they usually speak with their pastor and ask for a referral, even if they do not believe their pastor is qualified to deal with their problem. There is an increasing awareness of the vital role that trained pastoral counselors can fulfill for those who come to them for help. They may intervene either as a source of referral or as a counselor. Pastoral counseling involves four major functions that highlight the value of pastors and their task in this vital area. Healing as a pastoral function aims at restoring a person to wholeness physically, mentally, and spiritually. From Jesus we have received the command to heal (Matt. 10:1), along with the overwhelming model of His re medial, restorative involvement in the lives of people. In the early years of church life, anointing the sick with oil was a popular and meaningful pastoral function. By the ninth century fundamental changes in Western Christianity caused this healing function to be seen more as a preparation for death. It remains so today for many uninformed Christians. A contemporary therapeutic appreciation of Christian ministry indicates that anointing may be appropriate for individuals going through any number of physical, emotional, or spiritual crises. To relegate anointing to a preparation for death severely limits its original intended meaning and purpose. A dramatic and somewhat mysterious aspect of the healing function is exorcism. We have biblical reasons to believe that exorcism is a function of pastoral care. Although this need may not be the same in all places and cultures, wherever it presents itself, the pastor has a role to perform, remembering that Satan is now a defeated foe. We as ambassadors of the gospel have a duty to announce that the kingdom of darkness has been overthrown by the kingdom of Christ. We have the authority to command that the defeated foe leave those under his subjection (Eph. 1:18-23). 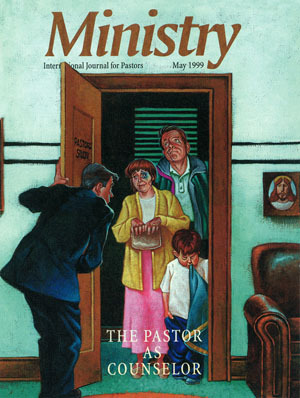 Sustaining has traditionally been the function of pastors whose parishioners are under persecution. Believers in Christ have at times had their courage severely tested as their enemies seem to win at every turn. The psalms are replete with this theme. "Why is this happening to me? Why has God turned His back on me?" The preservation of one's spiritual life and faith heritage, while going through physical, emotional, or spiritual trauma, is a vital part of the sustaining and consoling function of pastoral care. At times parishioners have experienced a series of losses so profound that any effort to explain or make sense of the tragedy is lost. Faith is shattered, belief that life is good disappears, and depression follows. The sustaining, counseling presence of a caring pastor can make this passage through the valley of the shadow more tolerable. Consolation is a vital part of pastoral care. The pastor as a member of the health care team may work with physicians and diagnosticians to support an overwhelmed patient who must choose from the many options offered by modern health care treatment. Many treatments can themselves be life-threatening or destroy the quality of life for a time. For example, to face a regimen of chemotherapy, patients need strong faith and personal support. Guiding comes when judgment combines with experience and comes to the help of another. With the break down of the nuclear family in so many contemporary cultures and the emergence of one-parent households, a vast number of experienced resource per sons are no longer readily available to parents and children. Less than one hundred years ago, a young adult who wanted basic information about life could simply walk down the street and talk to Grandpa, Grandma, uncle, or aunt. Today distance, divorce, and lifestyle make this difficult. Listening and responding with specific and relevant information, along with empathy and compassion, are vital resources to those with little support. Most health-care professionals do not have the time to provide this kind of help. But pastors can. Pastoral care and counseling can help sustain family values and provide a source of spiritually oriented guidance to parishioners in such areas as parenting, marriage enrichment, and conflict resolution. Reconciling. In the United States today there are more attorneys per capita than at any previous period in history, along with a proportionate number of lawsuits! For anyone who has participated either as a plaintiff or a defendant, legal solutions rarely satisfy anyone and are often simply a battlefield for more painful confrontation and lengthy litigation. Legal decisions cannot heal broken relationships and wounded souls. Therefore, competent pastors are increasingly involved in mediation and reconciliation. Many colleges and universities offer certificates and degrees in this emerging field. Pastors cannot afford to be with out the requisite skills in the area of reconciliation. Most pastors are experienced in the processes of forgiveness. However, even though there is confession and forgiveness, reconciliation does not necessarily follow. Scripture indicates that God has given us the ministry of reconciliation. This spiritual gift can have a significant benefit for conflict resolution in parish life. Reconciling implies walking together again in the same direction. Pastoral counselors should have a list of professionals for referral. At times individuals with diagnosed mental dis orders seek the assistance of a caring pastor. Without professional support, the pastoral counselor can be most vulnerable. Professional support may include a full psychiatric work-up and a sensitive and caring referral to an appropriate health-care professional. For instance, 82 percent of all lawsuits for malpractice in the physical and mental health professions are brought by those diagnosed as borderline personalities. Often individuals with a diagnosed illness can triangle, or emotionally hook, the pastoral counselor into a frustrating relationship. Should you find yourself frustrated or angry with a parishioner or client who has come to you for pastoral counseling, you should quickly seek the advice and support of a trusted mental-health professional and consider referral. You will find above a form I require all clients to sign. Feel free to adapt this form to fit your needs. The need for well-trained pastoral counselors has never been greater. Local, national, and international values, norms, and standards are in rapid transition. Today we have less compliance when it comes to parental, cultural, so cial, and legal criteria. The consequence is chaos. Sometimes it seems as if a lie is no longer a lie. Perjury is not perjury if "it was not my intent to perjure!" In such an atmosphere, well-trained, clear headed, wise, moral, pastoral counselors can be a welcome, even vital addition, to the health-care options available.